There is a new competitor to the Amazon Kindle e-Reader called the Biblio Leaf SP02. So what’s unique about this e-reader amongst all the e-reader and tablet competitors? Well, to start with it maintains par for the course with it’s 6-inch E Ink display (800 x 600 resolution), 2GB of internal data storage and a microSD expansion slot. Not to mention the 802.1b/g/n WiFi and 3G capabilities. But what’s unique with the Biblio Leaf SP02 is that it has a solar panel at the bottom which allows the cell battery to charge via sunlight…. that’s unique! 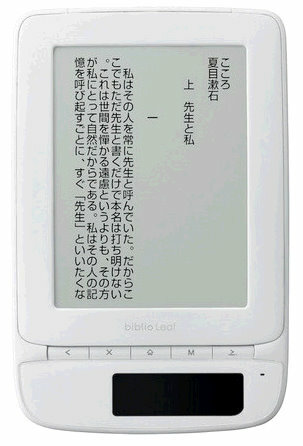 No price has not yet been released and the Biblio Leaf is expected to be available in Japan only.